In this video, I have the departure from D'Urville Island, where we headed out over the northern part of the island before returning to Wellington. Last Saturday two of us went out to D'Urville Island on a pre-Christmas fun flight, in Wellington Aero Club's awesome Cessna 172N, ZK-EKE. D'Urville Island is one of my favourite places to go to - not too far away, somewhat challenging, but quite doable - and I'll always try and get a few circuits in while I'm there. Anyway, here are two circuits [of 4 or 5 in total] that we did prior to heading back. Thanks to Andrew for the still photos included in the video. I hope to have another video which shows some of the northern parts of the island and the trip home available in another week or so. There was a very interesting visitor to Wellington on Saturday - a Dassault Falcon 2000EX, ZK-OCB, which is operated by Pacific Jets of an Auckland address. I'm not certain, but this would be one of the largest business jets on the New Zealand register [please correct me if I'm wrong!]. ZK-FML, a Piper PA38-112 Tomahawk, is back in Wellington after many years. This time it has had a full refurb and looks really good! 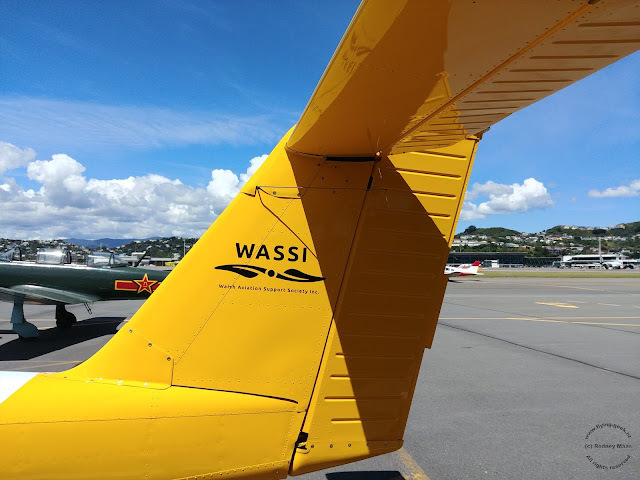 The new paint job looks much better than the previous livery :-) It is owned by the Walsh Aviation Support Society Inc. As the name implies, this aircraft will be a regular at the annual Walsh Flying School in Matamata. Anyway, I'm hoping this aircraft will be online with Wellington Aero Club shortly, so it's another one to watch the skies for! Today's picture is a Fiji Airways-operated Boeing 737-8X2, DQ-FJH, departing Wellington for Suva, Fiji. I'm hopeful that in the next few weeks, we'll see one of their new B737 MAX 8's come through. Last weekend I undertook a brief test of the camera hatch on Wellington Aero Club's Cessna 172N, ZK-EKE. I can't wait to play with this on some strips in the Marlborough Sounds or Wairarapa area in the next few weeks! Aircraft for the day was Wellington Aero Club's Cessna 172N, ZK-EKE. I'm hoping that in the next week or two I'll have some video from a wing-mounted camera hatch to show! Last Sunday was a rather different visitor - a USAF-operated Boeing C17-A Globemaster III, 07-7189! The aircraft arrived and parked up on the RNZAF Air Movements Base apron. It was appeared to be dropping off someone important with a VIP vehicle ready to whisk whoever off on their visit. Last Sunday was an exciting day for aircraft spotting, as you'll see in the next couple of posts! The weather was not quite so nice, but that was more than made up for by the arrival of some very interesting aircraft. In this post, I have a couple of civilian bizjet arrivals. First up is a Dassault Falcon 50, N115MF. This is one of a very limited number of 3-engine aircraft being flown these days and a very nice one at that! This aircraft was in and out fairly quickly. Next up is a Learjet 60, ZK-JAK, which is operated by JAK Air of a Rotorua address. It's a beautiful livery and it's good to see a less familiar, but locally operated, bizjet from time to time! Last Saturday was rather wet which made for some interesting arrivals and departures. Here's one of the better pictures I got. It's a Singapore Airlines-operated Boeing 777-212/ER, 9V-SRO, departing on its flight to Melbourne, Australia. Spotted at Wellington in the sunshine last Saturday was this Fokker F27 Mk 50, VH-FKO, which is operated by Alliance Airlines of a Queensland, Australia address. 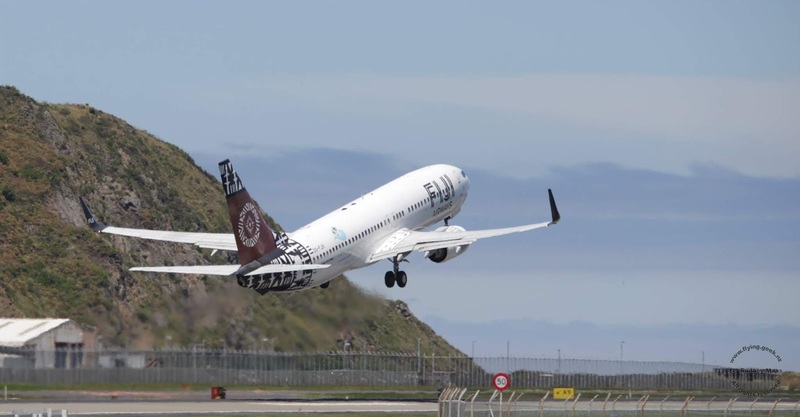 This aircraft is used in New Zealand on behalf of a tour company. Fokker F27 Mk50, VH-FKO, operated by Alliance Airlines.